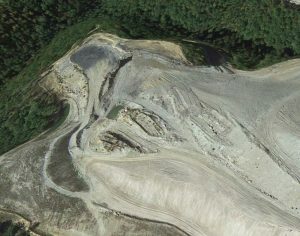 A satellite image on Google Earth, taken October 2013, of a mine in Breathitt County, Kentucky, owned by Frasure Creek Mining. In 2013 and 2014, Frasure Creek Mining submitted more than 100 reports to the Kentucky Energy and Environment Cabinet that contained false water monitoring data. These reports are supposed to be used to make sure companies are meeting the water pollution limits in their permits, but when companies turn in false reports, that task becomes impossible. In the first quarter of 2014, nearly half of Frasure Creek’s water monitoring reports were false. Most contained data copied from previous reports. But what if Frasure Creek copied a report that contained violations of their pollution limits? In a few cases where the first report contained violations, the entire report is copied except for the violations. A few years ago, Frasure Creek was the top producer of coal from mountaintop removal mines in Kentucky. It recently emerged from bankruptcy and in 2014, the company didn’t produce any coal from its 60 Kentucky mines, a fact that doesn’t seem to have affected Frasure Creek’s parent company Essar, or its billionaire owners, Shashi and Ravi Ruia. Although Frasure Creek has stopped producing coal for the time being, its mines continue to produce toxic pollution and continue to wrack up numerous violations from the state for failing to properly reclaim the mines. Friday’s lawsuit is the next step in what has been a long fight for clean water and proper oversight in Kentucky. We first uncovered similar false reports from Frasure Creek and two other coal companies 2010, and took legal action. Frasure Creek’s earlier violations have yet to be resolved. Late last year, inadequate settlements between Frasure Creek and the Cabinet were thrown out by a Kentucky judge, and that decision is now being appealed. Appalachian Voices is joined in these efforts by Kentuckians For The Commonwealth, Kentucky Riverkeeper, the Sierra Club and the Waterkeeper Alliance. The citizens’ groups are represented by Mary Cromer of Appalachian Citizens Law Center, attorney Lauren Waterworth, and the Pace Law School Environmental Litigation Clinic. Read past posts about our clean water lawsuits in Kentucky. An expert kayaker with a serious passion for protecting our waterways, Eric served as our Water Quality Specialist for the Appalachian Water Watch team from 2010 to 2015. Permits and Payments: Will Duke Energy ever stop polluting?